Quote: "A total of 40 firefighters from 10 stations battled for two hours to extinguish a fire at Tattersall Rd early Saturday morning. A building inside the scrap metal recycling yard caught fire at 4.15am." Quote: "The fire burned out one bus and damaged four others. Fire crews put the flames out quickly, but had problems getting into the facility because the electric panel for the gate also caught on fire." Quote: "This incident comes exactly two weeks after fire destroyed a brand-new school bus in Frisco." Quote: "ABC affiliate WTVG in Toledo reports flight Delta Flight 312 was en route from Detroit to Fort Lauderdale, Fla. Smoke began to fill the cockpit, according to the Lucas County emergency dispatchers, forcing the plane to land at Toledo Express Airport." Quote: "The woman suffered serious burns after her clothing ignited, but there was little fire in the apartment itself, they said." Note: Another person burning to death. Two girls, ages 15 and 17, were found burned and dead the day prior too, mentioned in the 2014-12-03 update. Lots of people have been mysteriously burning to death, especially in the last year. Clothes are getting contaminated. Quote: "The Maldives, famous for its pristine beaches and scuba diving, has declared a state of emergency after a fire at the capital’s sole water sewage treatment plant led to a shortage of drinking water in the Indian Ocean archipelago. The Maldives has appealed for aid from India, Sri Lanka, the US and China. About 100,000 people in Malé, the capital, have been left without safe tap water, according to Mohamed Shareef, a government minister." Quote: "A fire destroyed the only store in the Northwest Alaska village of Kivalina on Friday morning. Alaska State Troopers said in a dispatch they received reports at 2 a.m. Friday that the volunteer fire department was responding to a fire in the Kivalina Native Store." Quote: "Swan said the store is the only source of general products for people in the community. While many live off of subsistence foods, it was the only place to purchase things like diapers, formula and milk. 'It's a major loss,' she said." Quote: "Medical assistance was requested for people suffering from red eyes and vomiting, with those affected having been checked by doctors at the airport before taken to a hospital near the Italian capital." Quote: "Various news reports identified a foul odor in the cabin, which caused the domino effect of illness." Quote: "All 14 crew members, including the four pilots, were affected, and the mysterious smell made two passengers ill as well, an airline spokeswoman told the network." Note: An unknown odor just sickened 60 children in coastal Brooklyn (New York) the day prior too, mentioned in the 2014-12-05 update. From the full hypothesis: "There will be more unexplained HazMat events, often involving unusual odors. Eventually the entire populations of towns and cities will drop dead." Quote: "The woman was reportedly unconscious and suffering from kidney related issues." Note: To go along with all the corpses being found in and near low-lying areas like bodies of water, people are sickening too, or going missing. (The missing people are almost always eventually found dead though.) It's probably best to avoid bodies of water at this point whenever possible, if you're one of those wanna-stay-alive kind of people. Four high school students went to take a bath and died in a canal in Bhubaneswar (India), mentioned in the 2014-10-22 update. A family of four went swimming and all of them died at Henry Hagg Lake (Oregon), mentioned in the 2014-08-25 update. More than 200 people sickened after swimming at Horseshoe Lake near Mount Saint Helens (Washington), mentioned in the 2014-07-16 update. More than a dozen people sickened after swimming in Blue Lake in Blue Lake Park (Oregon), also mentioned in the 2014-07-16 update. And so on and so on. I could go on for a very scarily long time here with all the unexplained piles of corpses and sickened people near or in bodies of water, but that's why there's a search feature - so I can be lazy! Quote: "A massive fire at a Los Angeles construction site the size of a city block shut down sections of two major freeways for hours early Monday. Hundreds of firefighters battled the blaze, which broke out about 1:10 a.m. PT and could be seen for miles. 'This is a historic fire, what we as firefighters would call a career fire. It's huge,' Fire Department spokesman David Ortiz told NBC News." Note: This fire occurred after days of rain, and yet this building went up in flames incredibly fast. How can that be? Both methane and hydrogen sulfide, blowing in off the Pacific Ocean, are water-soluble. So that rain probably contained some dissolved gas in it, most likely methane since it's a lighter-than-air gas and is accumulating in the upper atmosphere where rain forms. So the rain fell and then it evaporated, leaving behind some of the methane, which will adsorb onto porous matter, like, say, WOOD. Eventually some hydrogen sulfide blew through, found some rusty iron/steel (this was a construction site), there was some sparking, a spark landed on that accelerant-soaked wood, and WHOOSH, this whole place went up in flames as if the entire gigantic structure had been doused with gasoline, which isn't all that far from the truth. From the full hypothesis: "So far as homes are concerned, vacant homes, unoccupied homes and homes under construction will burn hardest and first but the number of occupied homes burning will also be increasing." Quote: "The flames broke out as firefighters were battling a different blaze at an apartment complex under construction in downtown Los Angeles." Quote: "Firefighters are responding to fire that started on a boat and extended to a house in Seattle's Olympic Hills neighborhood." Quote: "Six buses were damaged by fire at the Center for the Disabled in Albany on Tuesday. Crews responded to the scene on South Pearl Street shortly before 2:30 in the morning. Officials say four buses were badly damaged, but there were no injuries." Quote: "Researchers probe the oceans off the west coast and see signs of the meltdown of icy methane similar in size to the BP oil spill..."
Quote: "Three construction workers are dead and three other people received hospital treatment after a fire erupted in a downtown Dallas high-rise, prompting the evacuation of thousands of office workers from the building. Dallas Fire Rescue spokesman Jason Evans said fire-rescue workers found the men in basement of the 50-story Thanksgiving Tower. They were in the thermal storage tank that's part of the heating, ventilating and air conditioning unit beneath the building. Evans says the preliminary belief is that the 10 a.m. Thursday fire was electrical in nature because of the thick smoke it gave off, but the cause and ignition point remain undetermined." Quote: "A crew member and two contractors died Thursday when a fire broke out aboard a luxury cruise ship docked at the eastern Caribbean island of St. Lucia, officials said. Some 650 passengers aboard the Oceania Insignia were evacuated safely and the remainder of the cruise was cancelled, Oceania Cruises said in a statement." Quote: "The back of a Rockford school bus burst into flames Thursday afternoon on Kishwaukee Street near the Morgan Street Bridge." Quote: "It rumbled my house I know that much. She was low and she was on fire. She had flames coming from underneath and on the sides. She was burning." Quote: "A fire reportedly broke out on the 'Costa Luminosa' in the early morning hours on Dec 11, 2014. Around 5 a.m. , while the cruise ship was sailing enroute from Santa Cruz to Antigua in the North Atlantic..."
Quote: "The fire reportedly occurred on the same day as the deadly engine room fire on the Oceania Insignia." Quote: "The cause of the explosion was not known." Quote: "The Colorado Springs Fire Department is calling an explosive fire overnight an accident, but still do not know what caused it. The fire broke out around 12:17 a.m. at a warehouse near El Paso Street and Fillmore. Many viewers called in reporting thick smoke and flames, and the sound of something exploding. A spokesperson from CSFD said at least two tractor-trailer units were in flames when crews arrived at Cintas Facility Services." Quote: "A man’s body was discovered inside a truck that ignited with explosive force on a Kelowna street Saturday night. The sound and percussive blast from an explosion rattled residents who ran outside to see the truck blazing on Casorso Road in the Lower Mission. Neighbours said it didn’t appear the truck had crashed into anything, and they were struck by the intensity of the fire, which occurred just after 7 p.m."
Quote: "On Sunday afternoon, Kelowna RCMP said police had identified the man whose body was found in the truck. Police do not suspect foul play, Sgt. Greg Dickie said, declining further comment." Quote: "Residents, who were angry over the delay of the fire fighters in arriving at the scene, attacked the firefighters with stones to express their displeasure." Quote: "It is not clear how many people died or were injured as at the time of filing this report. But witnesses suggested 'quite a number of people were killed and injured' in the incident." Quote: "The citizens of Akure last night experienced one of the worst explosion to ever hit the ancient city." Quote: "At least 16 boats and personal watercraft sustained heavy damage after a fire broke out at a South Florida marina. Rescue crews battled the blaze at the Haulover Marine Center, located along Collins Avenue in Haulover Beach, Saturday afternoon." Quote: "Grand Chute firefighters responded to Fox Valley Truck, 5668 Neubert Road, at about 6:40 p.m. and remained there until 10:30 p.m., according to Lt. Chad Martin. The Appleton Fire Department was called in to assist. Twelve vehicles and two trailers were damaged, Martin said. No one was injured, and the building on the property was not affected." Quote: "Area residents are complaining on social media about a strange smell that stretches from Pace to Gulf Breeze and the beaches. But local officials can't confirm what the smell is or where it's coming from." Quote: "The garage suffered significant damage, but firefighters were able to save an antique car, a 1930 REO, that was in the garage. Another antique car in the garage was destroyed, Burleyson said." Quote: "Nonetheless, Gillenwater said the home was a total loss including the motor home parked next to it and a couple of out-buildings." Quote: "The garage and a vehicle inside the structure, as well as two vehicles outside the garage, were total losses. The nearby house sustained damage, but was still livable..."
Note: Here's some more vehicle-related fiery destruction to homes and other buildings. Any building with a vehicle parked near it or in it will eventually be destroyed by fire and/or explosions. Therefore it's probably not a good idea to park a vehicle near anything you don't want to see on fire, and that's especially true if you live near, in or downwind of a low-lying area like a quarry, spring, river, pond, lake, valley, canyon, ditch, ravine, etc. Quote: "Quintin Oliver said there had been a 'visible shudder' throughout the plane. He said that some passengers noticed the fire half-way into the flight. 'It's a short 20 to 25-minute flight and there was a visible shudder throughout the plane and those on the left hand side behind the engine clearly saw it burst into flames,' he said. 'Some of them described it as a burning rocket, as the flames were shooting out the back and the plane lurched a little, not dramatically, but a little as it presumably stabilised on the second engine.'" Note: And yet another plane coming down on fire. Thanks for the fine reporting there, Quintin! Quote: "A mysterious sleeping illness has fallen on the residents of a remote Kazakhstan village which caused sufferers to sleep for days at a time. For the past four years, residents in the village of Kalachi have been afflicted by the disorder, which also causes dizziness, nausea, hallucinations and memory loss. So far more than 100 of the town's 600 residents have experienced the illness, the Russian Times reports. 'I'm weak, my legs feel heavy, as if I'm wearing a hundred pairs of boots, and my head is spinning,' one sufferer said. Other patients claim they behave 'like they're drunk' and that it's difficult to call for help as 'your tongue gets twisted'." Quote: "Classified as an encephalopathy of unclear origin - the highfalutin term for a weird brain disorder we can't figure out - villagers who do not simply keel over while moving or working report feeling weakness, dizziness, and memory and motor control loss. At least two children have reported hallucinations as well: Misha Plyukhin saw flying horses and light bulbs, his mother with eight eyes and a trunk, and snakes and worms in his bed, trying to eat his arms; Rudolf Boyarinos cannot remember his visions, but four people had to calm and subdue him as he screamed 'monsters!' The sleep is so deep that some locals fear an old man they assumed was dead could have been buried alive." Note: That sounds very much like hydrogen sulfide poisoning. The memory loss and the difficulty speaking (speech center of the brain) and probably the hallucinations too - that's brain damage, indicative of a neurotoxin. Quote: "'We heard an explosion. We thought it was a wreck,' said Alfredo Quintanilla, who lives nearby. 'That explosion was pretty loud.' The incident was reported at about 8:30 a.m. Thursday, just about the start of the normal work day." Note: Here's some more electrical infrastructure exploding and/or burning. Not looking good for people who enjoy electricity. Keep some flashlights handy! Quote: "Another Willow Creek resident officer arrived about 10 minutes later to find the 17-year-old lying naked next to his car, Jager said. 'He tried to give some commands to the driver and the driver was not responsive to any commands, and was being completely erratic and irrational,' Jager said. When the driver continued to be non-compliant, the officer Tased him, but he still did not put his hands behind his back, Jager said. At this time, two witnesses reportedly offered to help the second officer. By the time the driver was handcuffed, other officers and paramedics had arrived at the scene and life-saving attempts were initiated, Jager said. However, he said, the teenager died at the scene." Quote: "Witnesses told our sister station KOAA, they saw several cars on fire in the back of the fenced-off lot. The Stratmoor Hills Fire Department says between 20 to 30 cars caught fire." Quote: "Bystanders said the driver appeared to be have had a fit or a heart attack at the wheel of the vehicle." Quote: "Witnesses said the driver appeared slumped at the wheel after the vehicle had come to rest." Quote: "The driver of the Mercury, he said, 'must have been having some type of medical emergency. He zoned out and started drifting from the far right lane to the left lane and crossed the median and struck a work truck.' The scene was chaotic as the flames engulfed the two vehicles and briefly set nearby electrical wires on fire, Chaffin said." Quote: "The fire broke out in the funnel of the ship but was quickly extinguished by ship personnel, according to a statement from Costa Cruises. During the incident no onboard services were stopped and the ship reached its destination port in Aqaba, where it is now berthed. It is not clear whether the cruise -- a 25-day Indian Ocean itinerary -- will need to be abandoned." Quote: "Investigators say it’s hard to put a price tag on the amount of damage the fire caused, but say it’ll most likely cost more than a million dollars to repair the damaged boats and RVs. The storage building was also heavily damaged in the fire, but is not a total loss." Quote: "Yamal Peninsula in Siberia has recently become world famous. Spectacular sinkholes, appeared as out of nowhere in the permafrost of the area, sparking the speculations of significant release of greenhouse gas methane into the atmosphere. What is less known, is that there is a lot of greenhouse gas methane released from the seabed offshore the West Yamal Peninsula. Gas is released in an area of at least 7500 m2, with gas flares extending up to 25 meters in the water column." Quote: "When they arrived, three tractors, two cars and a van were fully engulfed in flames..."
Quote: "Three recreational vehicles were destroyed by fire at a Pinellas Park mobile home park Thursday morning, according to authorities. The RVs were in storage area and unoccupied when the emergency crews responded around 2:45 a.m."
Quote: "The couple says their car caught fire around 9am at their townhome near Aldine westfield and the beltway in northeast Harris County. Luckily, they were able to get out of the home and call 911 before the fire spread." Quote: "Officials tell LEX 18 that they don't believe the fire was suspicious at this point although there have been numerous dumpster fires recently in the area." Quote: "Police sources put the damages from the fire in the town of Springe in the federal state of Lower Saxony at around 10 million euros (12 million dollars), DPA reported on Friday. The blaze took 350 firemen and nearly 10 hours to control. Residents reported seeing flames coming from the shed -- which also contained several cars -- and hearing loud noises. According to the police, no transport staff was on the site at the time of the blaze as regional bus services shut down during the night." Quote: "The crew noticed that the right engine was on fire after the plane landed about 5:20 p.m. and activated an extinguisher, Stamper said." Quote: "Indonesia's top rescue official says authorities believe the missing AirAsia jet is likely at the bottom of the sea, based on radar data from the plane's last contact." Note: And the day prior, a tourist plane burst into flame after landing at an airport in Riverside (California), and a passenger plane was grounded after passengers smelled smoke at Logan Airport in coastal Boston (Massachusetts), both events mentioned in the 2014-12-26 update. So in less than 2 days that's one passenger plane disappearing off radar and (presumably) crashing into the ocean, one tourist plane on fire and one passenger plane smoking. One was over the ocean, one was near the ocean, and one was near a river near the ocean. Those 'Friendly Skies' are looking rather hostile nowadays. Not that ground vehicles or boats are doing any better though! Quote: "A Porter Airlines flight from Toronto to Sudbury was forced to make an emergency landing at Pearson airport Sunday night after the plane's cabin filled with smoke, a Radio-Canada reporter on board said." Quote: "The crew detected smoke in the flight deck and some in the cabin, according to Porter. The plane was diverted to Williamsport, Pa., where it landed safely and the smoke cleared." Quote: "The Norman Atlantic, sailing from Patras in western Greece to the Italian port of Ancona, was 33 nautical miles off the small island of Othonoi when it sent a distress signal, Greek coast guard officials said. 'The captain has requested the evacuation of the ship, according to initial information,' coast guard spokesman Nikos Lagkadianos said. The fire broke out in the garage of the vessel, which was carrying 222 vehicles, just before 6.00 a.m. local time (11.00 p.m. EST), the coast guard said." Quote: "A fire broke out on the car deck of a ferry carrying 466 people from Greece to Italy early Sunday, forcing authorities to order an evacuation." Quote: "The death toll climbed to 10 as survivors told of a frantic rush to escape, caught among flames, pelting rain and passengers who fought others for rescue." Quote: "A huge blaze has swept through a depot in Merthyr Tydfil, destroying 30 coaches, five minibuses and a car. The inferno triggered a series of explosions at First Call Coaches at Pant Industrial Estate on Sunday. More than 40 firefighters tackled the blaze which started shortly after 01:00 GMT. South Wales Police and South Wales Fire and Rescue are investigating, with a spokesman calling it 'a scene of devastation'." Quote: "Crews battled the fire for at least eight hours as it engulfed two commercial warehouses. Estevan’s fire chief Shane Code says at least four fuel tanks on trucks also caught fire." Quote: "The damage has been estimated to be in the millions of dollars." Quote: "The fire destroyed the two tankers while the nearby warehouse, which is under construction, was not damaged..."
Quote: "Investigators say the family woke up to 'loud popping noises.' When they walked outside, they saw their RV in flames. The vehicle, said Chief Darby, was parked close to the house and the flames soon spread to the attic. Fire officials say the house is a total loss." Quote: "The Gulf Shores Fire Department was also called in to assist fighting the fire, and, Chief Darby says, one of their firefighters suffered breathing problems and had to be taken to the hospital." Quote: "Emergency crews and the Franklin County Coroner were called to the vehicle fire shortly after 6 p.m. Sunday outside of Smay's home in the 14000 block of Charmian Road in Washington Township." 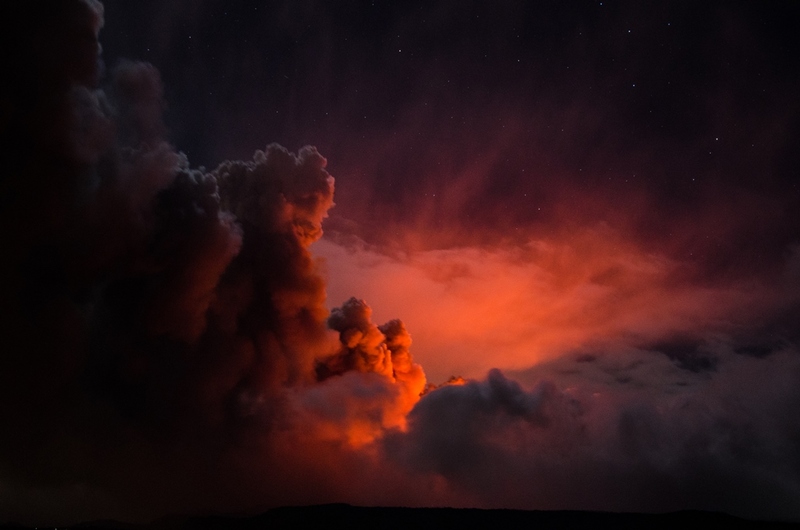 Quote: "A large volcanic eruption is taking place near Tonga's capital's Nuku'alofa, sending ash and steam into the sky. It is the same volcano which erupted out of the Pacific Ocean, 63 kilometres north of Nuku'alofa in 2009, creating an island. New Zealand's Metservice has yet to issue any aviation warning in the region, despite the large plume of ash. Known as the Hunga Ha'apai volcano, Matangi Tonga says it may have been erupting for more than a week." 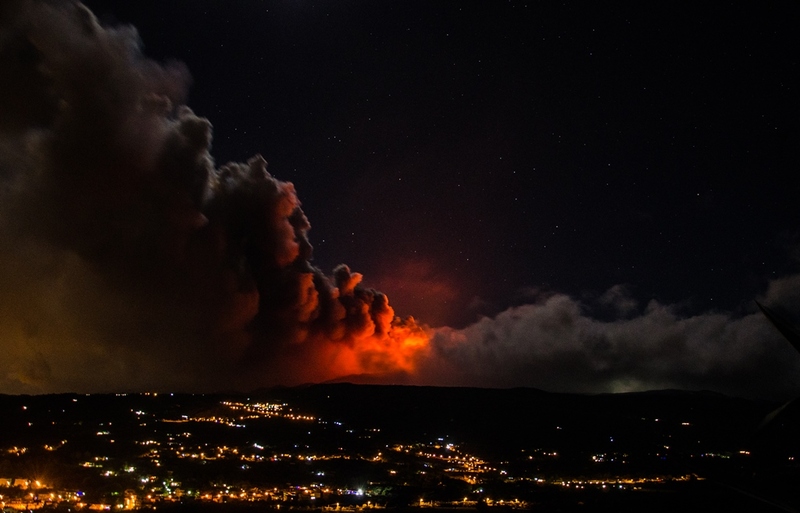 Quote: "'The volcano has ejected cinders to the altitude of 6,000 meters above sea level,' the source said. The aviation authorities have assigned the orange level of aviation risks to the eruption, which means that the volcanic particles ejected from the Sheveluch's crater pose a potential menace for all types of aircraft and can put out the engines of airliners and helicopters our of operation."